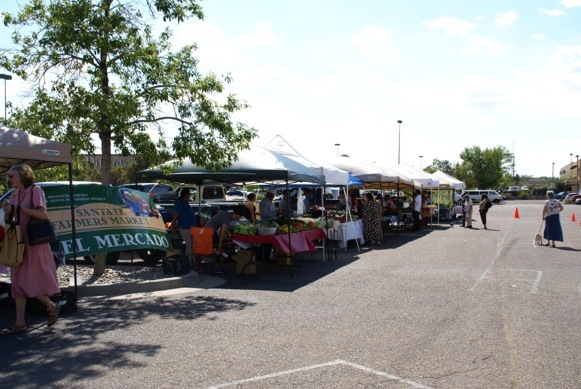 Today I’m highlighting a market that, as a Santa Fe resident, I should have visited a long time ago: the Southside Farmers’ Market. Despite the fact that it’s closer to my house than the main market, it just hasn’t been on my register, and I’m not alone; most of the friends and neighbors I talk with don’t even know it exists! 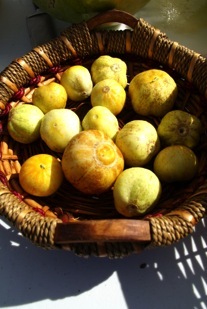 Just about everybody in Santa Fe knows about *the* Farmer’s Market, so… why does this one stay so under the radar? Well, it certainly doesn’t get the hype of the main market. In fact, it doesn’t get much advertising aside from a few signs placed at intersections around Santa Fe Place Mall on Tuesday afternoons. Without the advertising, the market feels like a secret waiting to get out. Given the Southside Farmers’ Market’s size (just 10 vendors on an average day), I was surprised by the variety of produce I found there: from everyday staples (several kinds of potatoes, tomatoes, onions) to local favorites such as lemon cucumbers, melons, and, of course, chiles. It’s definitely a no-frills kind of market–you won’t be serenaded by warbling buskers, and don’t expect to snack on a fresh pastry while you shop–but you’ll find everything you need for a week’s worth of homegrown produce. That fact is reflected in the habits of the shoppers: people don’t come for entertainment, they come for groceries. 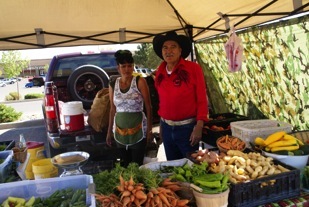 If you’re a regular market shopper in Santa Fe, you’ll recognize some familiar faces, such as pesticide-free Alcantar Farm. 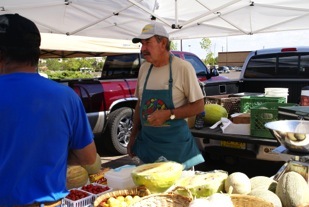 I even ran into Steve Jaramillo, who vends every week up at the Espanola market, selling his trademark yellow watermelons (which are, by the way, delicious). Because many of the Southside market’s vendors come to off-load leftovers from Santa Fe’s Tuesday morning market, the pricing structure is far different; I found onions priced at 3 for a dollar and non-GMO corn at just fifty cents each! If you ever thought shopping local was unaffordable, head to Santa Fe Place Mall on Tuesday afternoons and you’ll find yourself paying less than you would at many grocery stores. Maybe I’m selling it a little, mostly because I love the idea of this market, and I so want it to succeed–I want my favorite vendors to think it’s worth the trip to meet me where I live (maybe throw in a few buskers, too), and I want a community space protected from the tourism of downtown. 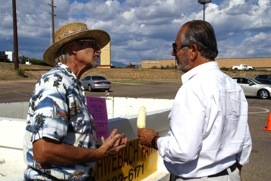 Unfortunately, there’s a risk that the Santa Fe Farmers’ Market won’t be able to keep supporting it. Market Manager Paolo Speirn says that, because of the market’s current sales, he can’t even charge a vendor fee to recoup expenses. It’s the same chicken-and-egg situation that markets face around the state: in order to get a large number of vendors interested, you’ve got to have shoppers, and vice versa. I think there’s a real opportunity here, so let’s go drum up some business and keep a reliable, accessible source of local food growing on the Southside. See you there next Tuesday?